This week, I had the pleasure of interviewing Geana Sieburger, founder of GDS Cloth Goods. 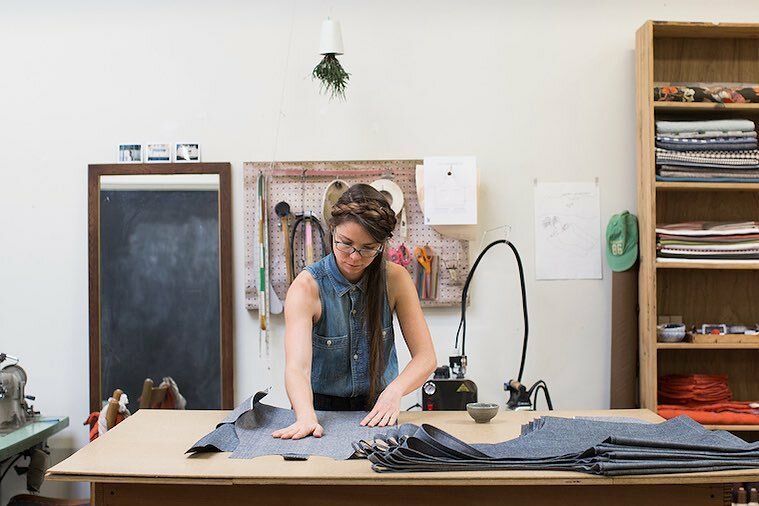 GDS Cloth Goods is an Oakland-based design and production studio creating aprons, smocks and other cloth goods in small batches for people who work in food and craft. In this interview, Geana talks about how she got started, changing the conversation around everyday goods, and her current Kickstarter campaign. What inspired you to start GDS Cloth Goods? It was a mixture of things. I was a born into a family of seamstresses in Brazil. Being a seamstress in Brazil meant being a tailor and a patternmaker, too. My grandmother and other women would come over and would draft patterns out of newspaper, just by looking at other garments and flat laying them. That really stayed with me. So, textiles have always been so fascinating to me. When I was in art school, despite being in the sculpture department, I kept gravitating toward textiles. And, my first job out of college was with a textile company. After a year of working there, I became the assistant textile buyer and constantly kept learning about textiles. I went from being more aesthetically interested in textiles to being interested in where the materials came from and how they were produced. What brought you to make cloth goods for everyday use in food and craft? I think what got me to make these utilitarian pieces that are for work and wear and for use is that I’m really interested in the most ordinary, everyday activities. I’m really in love with the word “mundane” and the history of the word. Before it meant “something boring,” it meant “something of the world.” It’s derived from the Latin word “mundanus” or “belong to the world.” And, I’m very intrigued by that. I’m constantly inspired by that. I think a lot of us are trying to get away from the mundane because we’re so busy. We’re trying to simplify the mundane tasks like doing the laundry, shopping for clothes, etc. But, I’m interested in how we can love those processes more. From our past discussions, I know that one of the biggest differentiators of your products is the types of fabrics you use. Tell us a little more about those fabrics. Because what I design is both made for use and made to last, I’m drawn to textiles like denim, heavier weight twills, heavier weight canvases, and a lot of cotton. The more I learned about those textiles, and really about their fibers, the more challenging my sourcing became. I’ll give you an example. The more I learned about cotton, the more I became drawn to organic cotton. Even though cotton is a biodegradable material, it takes a lot of resources and is really damaging to the land that it grows on. Not to mention that it’s chemical intensive, and hurts the communities that grow it and the people that live around it. So much cotton is grown today. It makes up about 40% of all fibers that exist. So, that’s a lot of harm that is happening to the world and its people right now. And, that’s also primarily the fiber that I’m using. In thinking about creating a design studio that is going to continue to use more and more of these fibers, I started to look at alternatives. Organic cotton right now is the best alternative. And going forward, I’m really excited about using fibers like hemp. But for now, that’s not very readily available. Can you talk about the new product that you’re about to launch in July? Ebb Filter (that’s “ebb” as in the movement of the tide out to sea) is a reusable cloth coffee filter. It’s made out of organic cotton and for use in specialty coffee. It was a big team effort, with me in the middle working with local baristas and a mill in South Carolina to develop this cloth that works well for brewing coffee while being a completely sustainable product. My main goal with this coffee filter was to create something that worked well enough to replace paper, which also meant that it had to be pretty easy to use. That’s a significant obstacle considering how we’ve become so used to single use and disposable goods. Why was it important for you to focus on creating a sustainable coffee filter? This is kind of a layered answer. One of the reasons is because a lot of people drink coffee. It’s the mundane thing you do when you get up in the morning. But what I’m really trying to do is engage in conversations with people through this product. What I hope Ebb Filter will do is start getting people to think about where things come from. If we can start to ask that question about something so simple as a coffee filter, then we might look around our homes and at what we’re wearing and ask “Where did this come from? Where did this fiber come from?” Not just where was it put together, but also who are those people that put it together. Can we look at other objects around our house and ask that same question? And right now, for the most part, we don’t know the answers to that for the products we use. There’s a complete disconnect. I really value the movement that we’re in the middle of with food. That is, moving to create more knowledge and transparency in food sourcing and trying to make more healthy foods available to us. I hope that Ebb Filter will become a part of that conversation and bring that same conversation into the world of textiles, especially since so much of it is an agricultural product and has the same effects on the land and people involved in growing it. You’re currently running a Kickstarter campaign so that you can launch Ebb Filter. Yes, the goal of Kickstarter is primarily to fund the purchase of the fabric we’ve been developing with the mill for the last year. That fabric will be made by a mill in South Carolina with fiber sourced from an organic cotton farm in Texas. Funding is also for a small expansion of our studio so we can increase our production capacity in Oakland. We really value keeping production in our local community. But, we need another machine and a little more space. Right now, whenever there’s more than one project at a time, it’s a constant shuffle. We have one table and everything gets done on that one table, so if we get two orders at the same time, we have to prioritize and ask our customers to be patient with us. With a little bit more space, more equipment, and more hands on deck, we can get all production moving quickly. It’s going well. We’re over 60% funded and have less than two weeks left in the campaign. We’re definitely feeling supported by our community. We knew that this would happen. We knew that people would come out and support us. But, we didn’t know who, when, and how much. For entrepreneurs who might be thinking about a Kickstarter campaign, how did you prepare for this campaign? I’ve been interviewing people who have done successful Kickstarters for the last six months. I think I’ve interviewed four different people and asked them every single question I could think of. Even if my campaign seemed different, I was trying to collect as much information as possible to reduce the chance of any surprises along the way. And, I think that was the smartest thing I could have done. Because I’ve heard so many people talk about their experiences with Kickstarter, I almost feel like I’ve done it before. And I’ve stayed connected with them throughout the campaign. At different stages if I’m not sure about something, I’ve been able to reach out to them and ask questions. And, when I’m a little stressed out on a day when it’s a little slow, they remind me it’s normal and to continue on. What has been the most challenging thing about the Kickstarter campaign so far? For me, and I think this is probably true for some other people, it’s really uncomfortable to put myself out there. I think I’ve actually held myself back in some ways because I’m so afraid of putting myself out there and my product out there. I fear that it won’t be embraced by the community even though I’ve been selling the filter in small batches for a little over a year now. And, it’s been well received. I think the hardest part is learning how to deal with that. And that’s just part of the process. How’d you get over the fear of putting yourself out there? I’m not over it. I have to remember that it’s me and it’s authentic. It’s not some product that I’m trying to make bank on. It’s really hard asking for things. And, remembering that there’s a larger goal and that it won’t happen unless I set my own personal fears aside and keep going. I just have to keep pushing through. What advice do you have for people who are building their businesses? There’s so much to learn. And, it can be so overwhelming sometimes. Just know that at every moment you have everything you need to be present at that moment. And, you just have to keep going. Be true to yourself. Be honest with yourself. Don’t judge yourself harshly for not knowing this or not having that. Know what your strengths and weaknesses are and continue to seek out things to make you stronger. Many people tried to tell me that but I didn’t hear it then. But that would have really helped me.